During the Nazi occupation of the Czech part of Czechoslovakia in World War II, the Small Fortress of Terezín was turned into a Gestapo prison and the Great Fort – the town of Terezín – a Jewish ghetto and transit station to death camps in the east. For displaced Jews, the Terezín ghetto was a place of suffering, but also of resistance – nearly unimaginable courage, self-sacrifice, and unending struggle to save the intended victims of genocide. 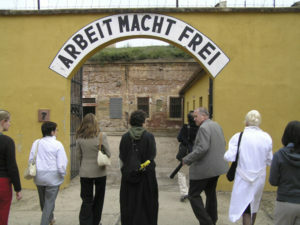 The key mission of the Terezín Memorial, the only institution of its kind in the Czech Republic, is to commemorate the victims of the Nazi political and racial persecution during the occupation of the Czech lands in World War II, to promote museum, research and educational activities, and look after the memorial sites connected with the suffering and death of dozens of thousands of victims of violence.